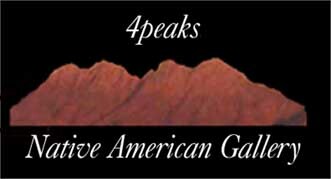 At 4peaks gallery we have developed a unique and contemporary website showcasing the finest in handmade Native American pottery. We are pleased to present pottery made traditionally, but stretching the envelope artistically and blending these two attributes into some of the most exquisite contemporary pottery made today. Our artists are considered to be innovators while maintaining their elite position at the top of their craft. We work very closely with our potters to acquire their unique pieces for presentation on this website. of collecting the finest Native American art available. We are committed to the principle that customer satisfaction is paramount to our success. · All our pottery featured on our website is made with all natural materials (slip and paints) and in the traditional manner  hand coiled and fired in an open pit. · We want to provide you with a convenient way to purchase items over time. We ask for 30% down and the remainder to be paid within three months. · After payment has been made, pottery will be sent out for a 7-day viewing. If for any reason the piece does not meet with your approval, please contact us by E-mail or fax and we will assist you in making arrangements for its return. We are dedicated to preserve and encourage the native american potters of the Hopi, Santa Clara, Acoma, and Navajo to maintain there traditional ways. In order to accomplish this goal we have worked directly with our pottery artists from the Hopi, Santa Clara, Acoma, and Navajo cultures.